Introducing GIMP for Absolute Beginners —The Only True Beginner’s Guide on the Market for Open Source Graphics and Digital Imaging— Released by Apress Media. Whether you’re a novice or professional, “GIMP for Absolute Beginners” will give you the necessary tools to begin graphic design from the ground up. Get the most productivity out of GIMP with authors Jan Smith and Rooman Joost’s newly-released guide, “GIMP for Absolute Beginners,” from Apress Media. Apress, the market leader for GIMP guides, releases "GIMP for Absolute Beginners" —the first beginner’s guide for GIMP version 2.8 and the only all-inclusive beginner’s guide being offered on the market today. GNU Image Manipulation Program (GIMP), a free software application, runs on Windows, Mac, and Linux systems, and contains nearly all of the components of its rival program, Photoshop. GIMP has been continually developed over the past 15 years and the 2012 GIMP version 2.8 features additions like Single-Window Mode and Paint Dynamics. Authors and GIMP experts, Jan Smith and Roman Joost, have taken this widespread tool and explained it in a clear and concise manner so that everyone from hobbyists to editing professionals can understand and utilize the concepts. “There is nothing like the exhilarating feeling of transforming an ordinary image into a very good or even a great image. It is not so great if you are stuck or if you do not know how to do something in GIMP,” Smith remarks in the introduction of the book. Smith and Joost make it a point to create a fun learning experience and leave no question unanswered. The book covers essential topics —from how to manage small photo alterations to creating original artwork without an already existing photo. Users are not expected to have an existing knowledge of GIMP and will learn the software from top to bottom. Designers, photographers, graphic design newbies, and those who just like to edit photos and graphics for fun will all benefit from this comprehensive guide. 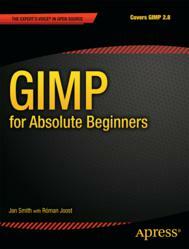 To learn more about GIMP for Absolute Beginners, visit http://www.apress.com/9781430231684. Jan Smith discovered GIMP nine years ago while volunteering at Computerbank (a company that refurbishes donated computers and sells them cheaply to low-income users to help bridge the digital gap). Jan has assisted hundreds of low-income individuals become familiar with computers loaded with open-source software. Rooman Joost first learned about open-source software in 1997. He is the project manager of GIMP’s user documentation and he has contributed code to GIMP. He has contributed to GIMP and Zope open-source projects for eight years. Roman has a Diplom-Informatiker (FH) from Anhalt University of Applied Sciences in Koethen, Germany.